This post sponsored by Whiteflash.com. Featured in the Chicago Tribune, The Washington Post and the New York Times, Whiteflash is a standout jeweler located in Houston, Texas. 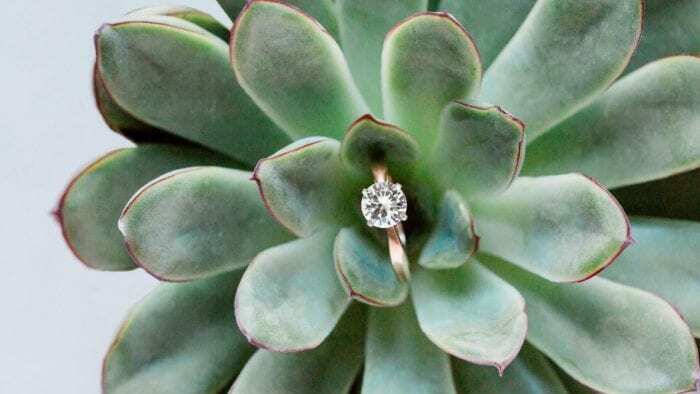 Known for their specialization in ultra-modern diamonds and bridal jewelry, they’ve also been hailed as “Lord of the Online Rings” by Kiplinger’s Magazine and serves clients throughout the globe – from at home in the U.S. to Australia. If you’re thinking about purchasing an engagement ring or upgrading to a bigger, clearer diamond, look no further than this Internet hot spot. 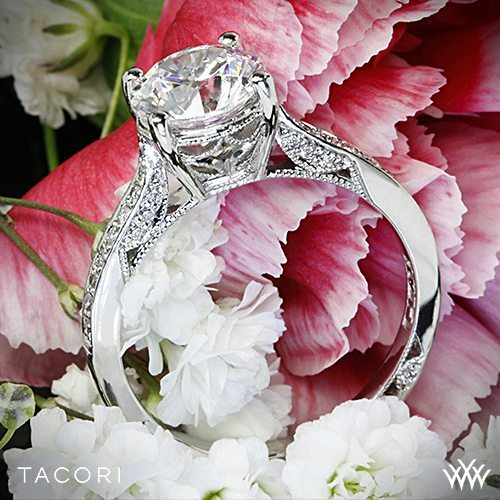 With their international acclaim and the fact that they house some of the finest diamond jewelry, including Tacori, you’ll have the opportunity to make a selection with both confidence and excitement. 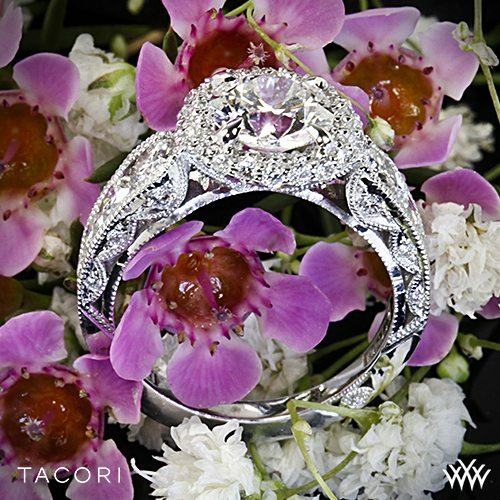 When it comes to Tacori engagement rings, there’s truly a design to fit everyone’s unique tastes. 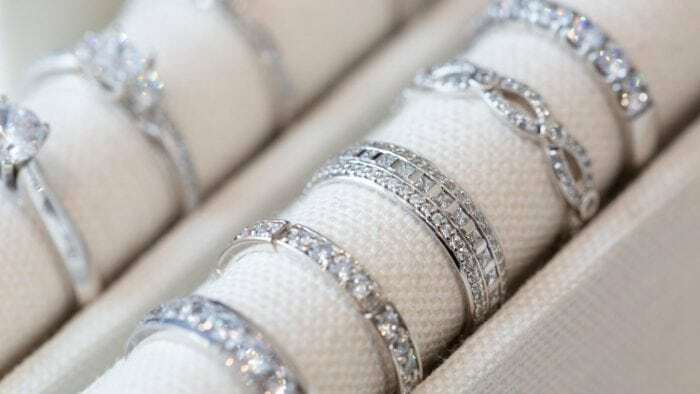 From white to yellow gold, from round to cushion cut, from modern to vintage flair – this brand has it all. 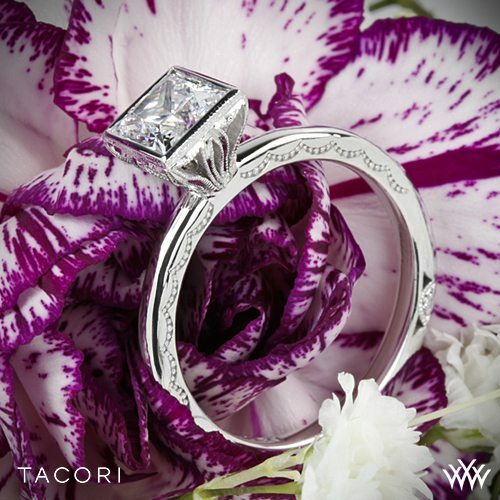 Tacori rings are all handcrafted by artisans in California. You can not only trust the workmanship and quality, but that you’re getting a piece of art that will last a lifetime. 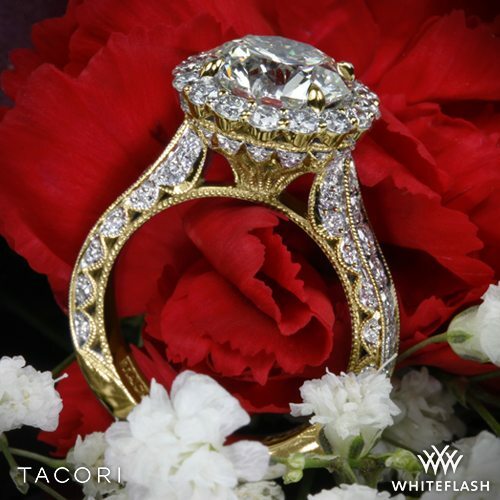 Beginning with only a sketch and then uniquely handmade and shaped with bare hands throughout dozens of hours, Tacori jewelry easily becomes family heirlooms and cherished, tangible memories. Coming in both round and princess cut, in order to receive the A Cut Above brand, a gemstone has to receive the coveted Triple Ideal from the American Gem Society Laboratory. The diamond then has to pass a series of tests that represents their light performance quality and aesthetic. These are exclusive, special diamonds that will always stand out among the others. This classic, princess-cut diamond ring has been dipped in a shiny 18k white gold and will speak to the hearts of so many brides-to-be. 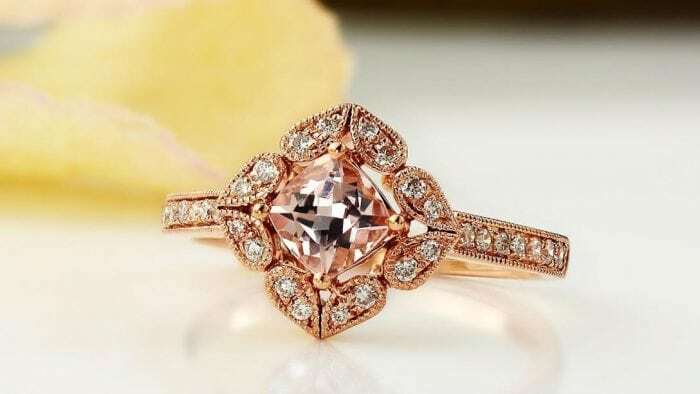 It’s delicate, feminine and holds so much romance in its dainty design. 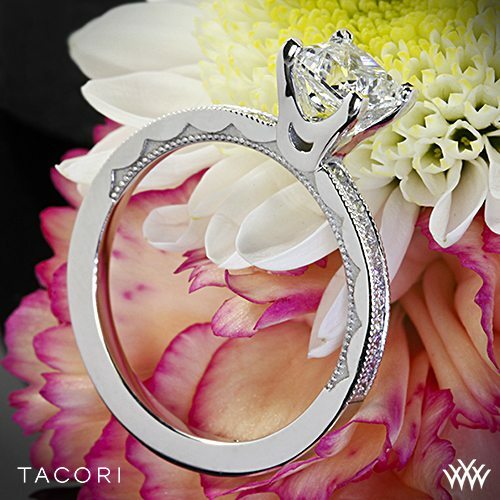 This design also comes in 18k white gold and showcases a gorgeous, solitaire pave set diamond. Those delicate details present focus and more chance for sparkle at every angle. Another princess-cut diamond ring with a timeless finish, this design would certainly withstand the test of time. 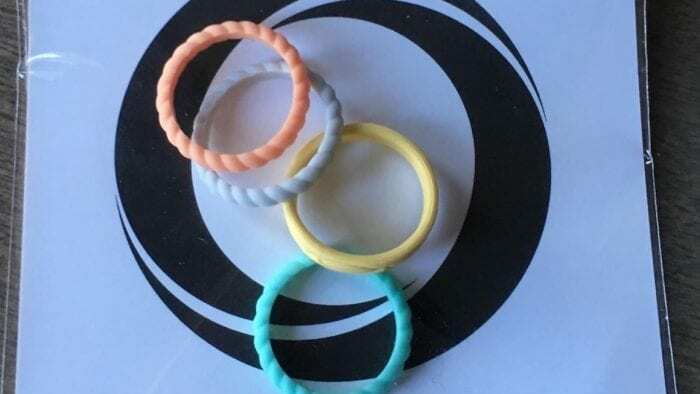 And pay attention to those surprising crescent details that pop from the side of the ring with personality and uniqueness. If you’re looking for a super stunner, then this full bloom design will definitely strike your fancy. 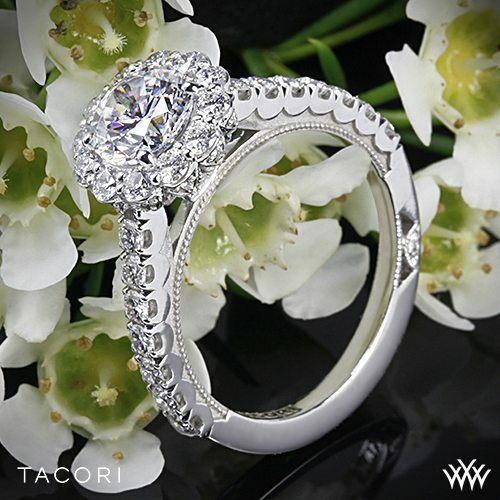 There’s a French-cut, round diamond that sits in the center while the rest of the gems encircle and enhance its beauty – it’s got that signature, Tacori crescent hidden in the details too. Here’s another design from the “Full Bloom” collection that we’ve fallen in love with. 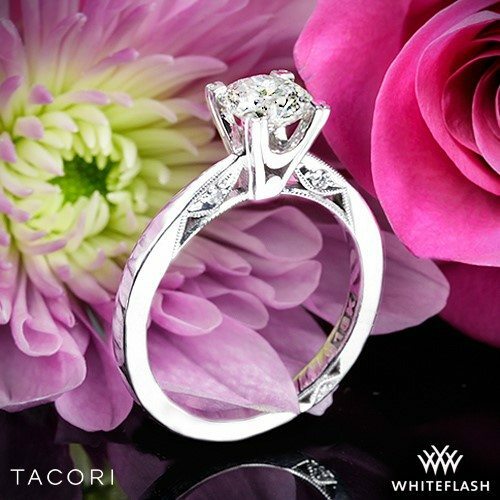 Its center diamond is accented in a way that makes you feel like you’re wearing a blossoming, glittering gemstone and those Tacori crescent details on the side are beautifully lit by its shine. A daintier ring with a romantic presence, this starlit diamond feels very youthful and bright. Don’t miss any of these details here either; from the pin-dot constellation on the side to the diamond’s “crown” on top. You’ll really knock your bride-to-be’s socks off with this stunning design. Between the yellow gold and scattered pave diamonds, there’s so much about this ring and its many details to fall in love with. Another ring that screams timeless style and elegance, this round-cut diamond ring will certainly steal your heart. 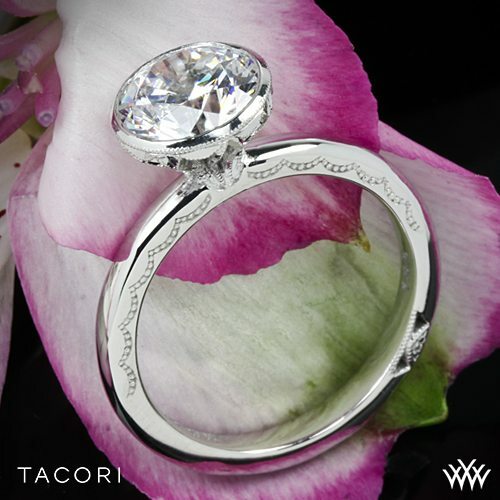 It’s chic, it’s clean but it still holds those signature, Tacori crescents where you’d least expect it to round out the design. Instead of just one bloom, you get two in this blossoming beauty. 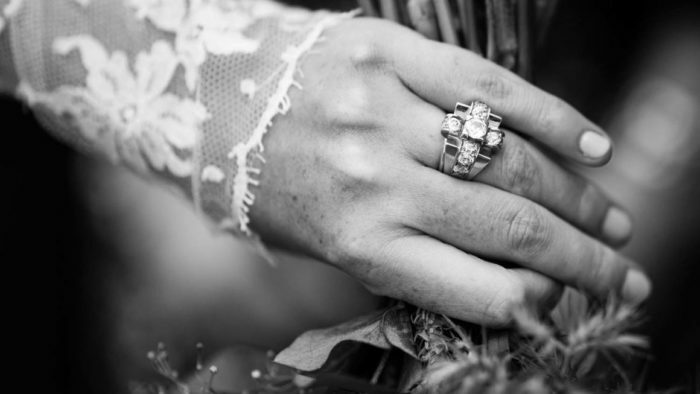 With a unique design on both sides of its center diamond, this ring has a certain amount of vintage appeal and sophistication that many brides crave. One of the most simple designs of the bunch, this is a beautiful choice for this with more minimalist and modern tastes. Showing a gorgeous, round solitaire diamond, the centerpiece is accented nicely by a small bout of crescent details and a high-gloss band.